There are only a few weeks left of summer, but as the days start to cool and the tans start to fade, we can at least enjoy the lush late-summer produce that's filling the market stalls. Sweet corn, juicy tomatoes, those oversized zucchini and squash--all ripe, sweet, and bursting with flavor. 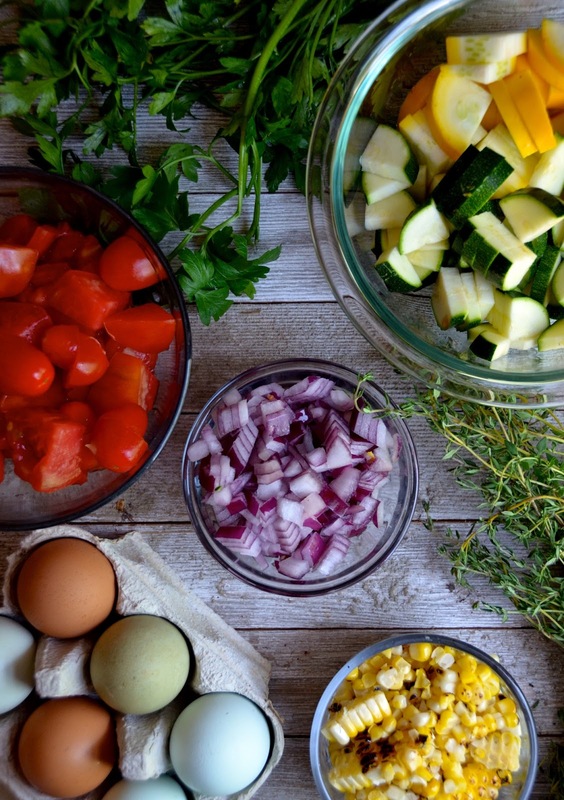 This veggie frittata brings all of them together (along with a bit of salty cheese, of course!) for a simple stove-top meal that works at any time of day. I shared this recipe on the TODAY Show this week (along with this spicy green juice that doubles as a fab Bloody Mary alternative!). 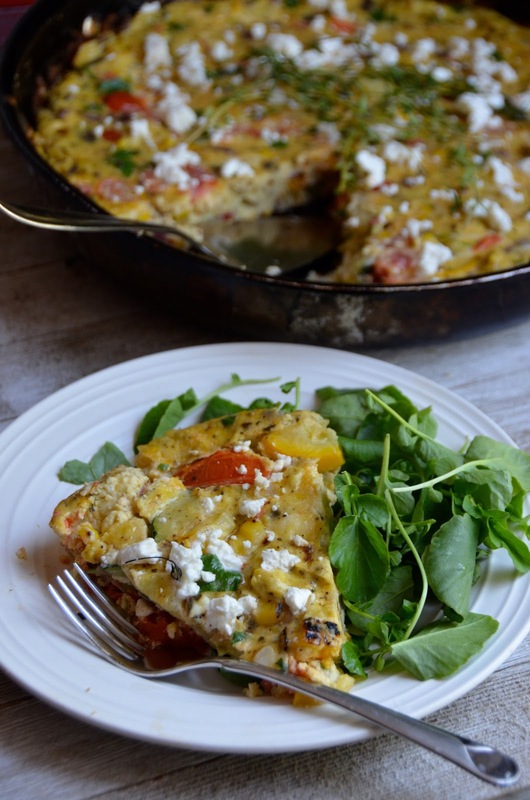 I love this veggie frittata served hot for a lazy weekend brunch, or sliced and wrapped for grab-and-go breakfasts throughout the week. Leftovers are amazing for lunch, or combine this with a big salad and some crusty bread for a no-fuss weeknight dinner. This recipe is vegetarian, but if you'd like, add leftover cooked ham or sausage. Or fry a few slices of bacon to crumble it. This stove-top version is perfect for hot summer days. You'll need a skillet with a tight-fitting lid to help the eggs cook completely. But if you prefer, you can pop it into the oven or under a broiler (just make sure to use an oven-safe skillet). Or any of these 25 Awesome Breakfast Recipes! In a large bowl, whisk together eggs, half & half, 1 teaspoon kosher salt, 1/2 teaspoon black pepper, thyme, and basil. Set aside. Heat a couple tablespoons olive oil in a 10-inch nonstick skillet over medium-high heat. Add the onions, zucchini, and squash. Season with a pinch of salt, and saute for about 5 minutes, or until squash is tender. Add the tomatoes and corn, along with another drizzle of olive oil (if needed), and cook for an additional 2 minutes. Pour in the beaten egg mixture and scatter the cheese around the top. Lower the heat to low and let cook uncovered for a few minutes, occasionally pulling in the egg around the sides until curds form all around the edges. Cover with a tight-fitting lid and let cook for about 10 minutes, or until eggs are set all the way through. Remove from heat, garnish with additional crumbled cheese and fresh herbs, and serve in the skillet.